On June 18, 1908, the first Japanese immigrants arrived in Brazil, aboard the Kasato Maru. A new era was about to start for Brazilian culture and ethnicity, but permanence was not first and foremost in the mind of the newly arrived workers who had responded to the appeal of a Japan-Brazil immigration agreement. Most of them had imagined their trip as a temporary endeavor – a way to achieve prosperity before returning to their native country. The trip from Kobe to the Santos port, in São Paulo State, lasted 52 days. Besides 781 workers bound by the immigration agreement, there were also 12 independent passengers. The Friendship, Trade and Navigation Treaty which made the trip possible had been signed in Paris in 1895. However, a crisis in the Brazilian coffee industry which lasted until 1906 had delayed the first entry of Japanese immigrants. In 1907, a new law allowed each Brazilian state to establish its own immigration guidelines. São Paulo State determined that 3,000 Japanese could immigrate over a period of three years. Japan went through great transformations under Emperor Meiji (Mutsuhito), ruler from 1867 until his death in 1912, who took upon himself the mission of modernizing Japan. Some events of the period affected the economy adversely. In the transition from the nineteenth to the twentieth century, Japan suffered the sequels of the First Sino-Japanese War (1894-1895) and the Russo-Japanese War (1904-1905). Among other difficulties, the country was struggling to reabsorb returning soldiers. In the meantime, the coffee industry in Brazil was growing and an increased need for farm workers, due in part to the liberation of slaves in 1888, had prompted the Brazilian government to open up ports to immigration. Before Japanese immigration started, many European immigrants had entered Brazil. The trip from Japan to Brazil was subsidized by the Brazilian government. Campaigns advertising work opportunities in Brazil to the Japanese population promised great gains to all willing to work on coffee farms. However, the newly arrived workers would soon discover those promises were false. Made in Japan, a Brazilian publication about Nikkei (Japanese and descendants) life, reports that first impressions of the Japanese immigrants were recorded in a notebook by J. Amâncio Sobral, a Brazilian immigration inspector. He noted the new immigrants' cleanliness, patience, and orderly behavior. Upon arrival in Santos, the immigrants on the Kasato Maru were received at an immigrants' lodge. They were then transferred to São Paulo, where they spent some days at another lodge before being taken to the coffee farms. Today’s Immigration Memorial in São Paulo, based at the building which replaced the first immigrants’ lodge, has a replica of a Japanese dwelling on a coffee farm. Even though Japanese immigrants had lived in frugal conditions in Japan, those could not compare to the bare wooden sheds with dirt floors that awaited them in Brazil. The harsh reality of life on coffee farms – inadequate living quarters, brutal workload, contracts that bound workers to unfair conditions, such as having to purchase supplies at outrageous prices from plantation stores – caused many immigrants to breach the contract and flee. 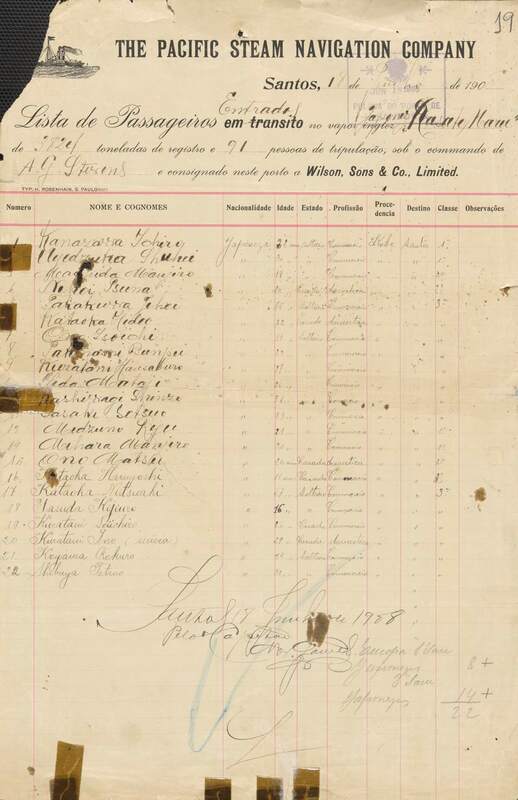 According to data from the Museum of Japanese Immigration in Liberdade, São Paulo, published by the ACCIJB - Association for the Celebrations of the Japanese Immigration in Brazil, the 781 Kasato Maru contract workers were hired by six coffee farms. By September 1909, only 191 immigrants were still on those farms. The first farm to be abandoned in great numbers was Dumont, in the current-day town of Dumont, SP. According to Estações Ferroviárias do Brasil, before the arrival of the first Japanese immigrants the Dumont farm had once belonged to the father of Alberto Santos Dumont, Brazil's aviation pioneer. The inactive Dumont train station at which the early Japanese immigrants arrived is still standing. On June 28, 1910, the second group of Japanese immigrants arrived in Santos aboard the Ryojun Maru. They faced similar difficulties in adapting to life on coffee farms. In her paper “Being ‘Japanese’ in Brazil and Okinawa”, sociologist Kozy K. Amemiya explains how Japanese workers who abandoned São Paulo coffee farms ventured as far as the northeast and other remote areas, creating support associations which were to become a crucial factor in later historic developments of Japanese life in Brazil. The last Kasato Maru immigrant to pass away was Tomi Nakagawa. In 1998, when Brazil celebrated 90 years of Japanese immigration, she was still alive and took part in the festivities. In 1980, the saga of the first Japanese immigrants in Brazil reached the silver screen with Brazilian moviemaker Tizuka Yamazaki's Gaijin - Caminhos da Liberdade, a movie inspired in her grandmother's story. In 2005, the story continued with Gaijin - Ama-me como Sou. For more information about the Nikkei community in Brazil, visit Bunkyo in São Paulo, where the Museum of Japanese Immigration is located.